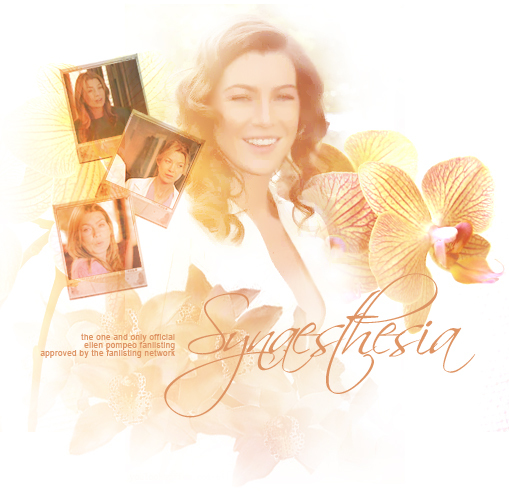 Welcome to Synaesthesia, the one and only approved fanlisting for the actress Ellen Pompeo by TFL.org! This fanlisting was opened on April 2, 2005 by Vicki and is part of youlooksofine.com. If you have any questions or comments, feel free to e-mail the webmistress. I am NOT Ellen Pompeo nor do I know how to contact her. I am just a fan like yourself, nothing more. Please DO NOT send me e-mails addressed to Ellen about how much of a fan you are. I have been having the same group of individuals sending one e-mail after another in a short period of several hours or a day. "Ellen Pompeo made her major studio screen debut in Brad Silberling's Moonlight Mile, starring alongside Susan Surandon, Dustin Hoffman and Jake Gyllenhaal. She received outstanding reviews for her portrayal of an outspoken young woman carrying a silent burden that's breaking her heart. A native of Boston, Pompeo was most recently seen starring opposite Luke Wilson, Vince Vaughn and Will Ferrell in the wildly successful "Old School" and, before that, in Steven Spielberg's Catch Me If You Can, opposite Leonardo DiCaprio. Ellen Pompeo currently stars as Meredith Grey on Grey's Anatomy (airs on Sundays @ 10pm after Desperate Housewives on ABC). 5.2.06 Ellen Pompeo will be appearing on the Ellen Degeneres Show. Check the website for the time and channel (thank you to Abby Oppenheim). 12.25.05 Added more Meredith Grey Quotes and a clip of Ellen Pompeo on MTV Punkd.